We’d love your help. Let us know what’s wrong with this preview of Triumph of the City by Edward L. Glaeser. A pioneering urban economist offers fascinating, even inspiring proof that the city is humanity's greatest invention and our best hope for the future. America is an urban nation. More than two thirds of us live on the 3 percent of land that contains our cities. Yet cities get a bad rap: they're dirty, poor, unhealthy, crime ridden, expensive, environmentally unfriendly.. A pioneering urban economist offers fascinating, even inspiring proof that the city is humanity's greatest invention and our best hope for the future. To ask other readers questions about Triumph of the City, please sign up. Edward Glaeser attempts to provide that schooling to the elite population that has grown increasingly blind to the needs of those downtrodden in the city. Glaeser sees a city not as buildings and infrastructure but primarily as people living, working, and thinking together. One of the things he strongly advocates is governments to stop saving poor cities, and start saving poor people. Governments conflate the two but they are very different things. An interesting statistic he whips up is that those from New Orleans displaced by the Hurricane Katrina, made 37% gains in the test score gap between whites and African Americans, as compared to those who stayed. At least half of the 200 billion USD spent on infrastructure could have gone into housing and school vouchers. While Glaeser can be extremely passionate, he is not unreasonable. He advocates for spending on infrastructure with a sensitivity to the supply and demand, which really means with a sensitivity to people. Glaeser heavily criticizes, not people suburbanising but policies that nudge sub-urbanization, corroborating his censure with evidence of how environmentally unfriendly it is when you move to a once rural place, live there as you would in city and drive to work everyday. He advocates building up, skyscrapers within reason. 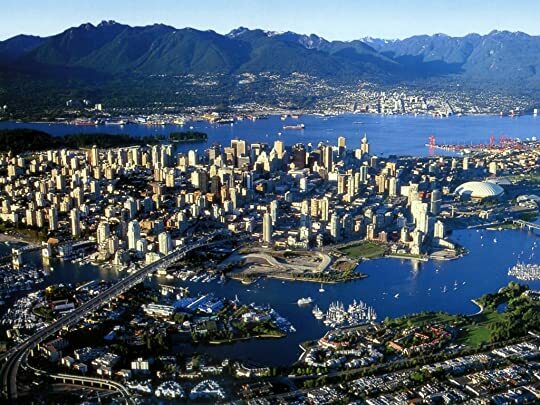 An interesting example is that of Vancouver, that happens to have both tall buildings and large open spaces. The book is sprinkled with interesting bits of history, like the one about Henry David Thoreau having started a massive forest fire in the Concord forest, a fire that he never repented, at least not publicly. He asked how different it was from lightning causing a fire. Amusing, how similar sounds to the climate change deniers and heartening, because perhaps they too will see it someday. My only point of disapproval, is that Gleaser doesn't give enough emphasis on how large dense cities have been affecting groundwater supply. Apart from that, this book is an excellent introduction to a less emotional, more practical view on urban planning. Concrete has become synonymous with a destruction of nature and human intimacy, but that view is neither true nor productive to urban planning policy. This is a frustratingly uneven book, written by someone with many good, interesting ideas who has not learned to knit them into a book-length whole. His background as a published academic used to writing more focused work makes sense, given that the book reads so disjointedly. Most of the book is written as separate chapters, touching on various mainstream urban ideas that are loosely knit together. The best parts are when the author begins to explore the role of serendipity and historical decisi This is a frustratingly uneven book, written by someone with many good, interesting ideas who has not learned to knit them into a book-length whole. His background as a published academic used to writing more focused work makes sense, given that the book reads so disjointedly. Most of the book is written as separate chapters, touching on various mainstream urban ideas that are loosely knit together. The best parts are when the author begins to explore the role of serendipity and historical decision-making on present urban forms. However, he doesn’t spend very much time on this. Then he quickly mashes together some prescriptions for urban problems at the end. This last part should have been half the book, because the reader is left feeling like the author really could solve some of these problems, if only he would go into more detail on something he has thought so deeply about. Reading this book is like being at a party with your smartest friend, when they are terribly distracted by personal problems and the rush of daily life. Given his many other commitments, it’s understandable. However, this book was brought to press too soon. When he hints at brilliant, the author’s mind is clearly five-star, even if the book is only a three. This book would be enjoyable for someone who knows little about the subject matter, but for anyone more widely versed in the field, it’s likely to be disappointing. Wait for his next when he has ironed out the kinks. He is sure to hit it out of the ballpark then. If you're into urban economics at all, or even just have an interest in how living in whatever city you're in improves your life, anything by Glaeser should be mandatory reading. He's a Harvard economist who also writes for the New York Times' Economix blog about urban issues, and this book is a synthesis of much of his recent work on cities. 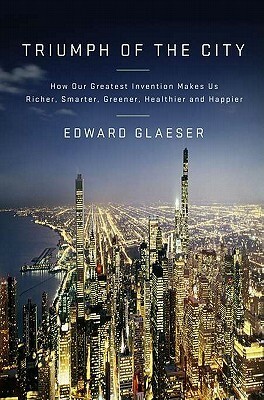 The first part of the book is dedicated to enumerating the many economic advantages that urban areas provide over non-urban areas, especially in their role If you're into urban economics at all, or even just have an interest in how living in whatever city you're in improves your life, anything by Glaeser should be mandatory reading. He's a Harvard economist who also writes for the New York Times' Economix blog about urban issues, and this book is a synthesis of much of his recent work on cities. The first part of the book is dedicated to enumerating the many economic advantages that urban areas provide over non-urban areas, especially in their role as innovation incubators. One great insight he throws right at the beginning is that cities themselves are actually an invention - the concept of collecting buildings close together to facilitate trade and idea-sharing was something akin to the concept of running electrical pulses across wires or building irrigation channels for crops - and that this insight, that people do their best work when surrounded by other people, has helped spur countless other inventions since. The multiplier aspect of cities, the way that they encourage the commerce and idea-sharing that improves human lives, is something he explores at great depth, and it doesn't take long at all before the reader is caught up in his infectious enthusiasm for the many benefits of urban living. Each chapter in the beginning and the end thirds is full of mini-history lessons from around the world - Nagasaki's role as a port town, Bangalore's place in India's technology boom, Silicon Valley's genesis as a research center, New York City's struggles with growth and crime, Baghdad's history as an intellectual mecca - each of which are the distillation of vast amounts of research, and the cumulative impact of the artfully linked statistics is enormous. Even the most hardened suburbanite would be forced to reconsider their SUV and backyard patio after just that first section. Glaeser himself was born in Manhattan, which he admits colors his judgment, but that never obscures the facts that back him up, and the middle third of the book, once he's finished touting the substantial health, educational, and romantic benefits that cities have brought to humanity, is an explanation of why so many people, including him, have eventually turned their back on these dynamic growth engines and decamped for the suburbs. There's a somewhat poetic cast to this story of migrations from farms to towns to big cities to suburbs to exurbs, but in Glaeser's reckoning, the biggest contributors to sprawl and deurbanization in the US are prosaic things like the invention of the automobile, the popularity of air conditioning, and in particular overzealous land regulations in the older, colder Northeast metro areas. Cities may have profound influences on economic activity but they are not exempt from the laws of economics themselves, and if housing supplies are limited by historical preservation boards, rent control laws, mandatory parking lot statutes, and poor zoning regulations, then the cost of living will increase and people will move to areas where there are fewer artificial constraints on growth. Now that the data from the 2010 Census has been released, it's become clear just how dramatic the consequences of different attitudes towards growth are: Houston, Dallas, Atlanta, and other metropolitan areas that place few obstacles to housing construction have expanded dramatically, while New York, Chicago, and Philadelphia, etc. have struggled to move beyond their decades-old population plateaus and in some cases, like Buffalo, Detroit, and Cleveland, are seemingly unable to stop their slow downward spirals. Now obviously there are many potential factors behind these shifts, such as national-level phenomena like business cycles, taxation rates, immigration patterns, the shift from manufacturing to services, explicit and implicit car subsidies, the aging of America, and many more, but it's hard to look at the vast cost, quality, and lifestyle difference between buying a tiny TriBeCa studio and the equivalently-priced Friendswood ranch house and conclude that this choice plays no role in determining where people choose to live. There's a fascinating breakdown of The Woodlands, a master-planned community a few miles northwest of Houston. I happen to have some friends from this city, and so I enjoyed that what they all consider the epitome of a bland exurban wasteland was originally designed as an environmentally-responsible garden city. The enduring paradox behind "environmentally friendly" developments like The Woodlands is that the more their architects plan for parks, green spaces, and open wooded areas to preserve a sylvan character, the less environmentally friendly they actually become. New Yorkers (and residents of big, dense cities) use vastly less energy in heating and transportation than Woodlanders do because they're able to take advantage of economies of scale and proximity - the true tragedy of modern NIMBY environmentalists is that by pushing people to the suburbs and less dense cities with restrictive zoning laws and historical preservation districts, they encourage much more harm to the environment than if they had simply let more people move to New York. Glaeser has three suggestions for municipal governments to reduce this flight. First, replace permitting with simple fees based on easy criteria. If adding a bar to a residential neighborhood imposes hidden costs on that neighborhood, then simply set a price on those costs and charge the bar owner up front, rather than going through a tortuously slow approval process. Second, cap the number of undemolishable landmarks the city can have. Cities are all about growth and change, and, contra Jane Jacobs, the more buildings get designated as historical and therefore immune to demolition, the higher prices have to rise in surrounding land to accommodate demand. Setting a reasonable cap would allow cities to add new buildings as appreciation for their merits grows (remember that even the Eiffel Tower was hated at first), and also force them to delist buildings which would be better served by a wrecking ball. Finally, and this is where he loses me, he suggests devolving some powers of zoning/building approval from City Hall to individual neighborhoods. In my experience, the fiercest opponents of growth are the people most directly impacted by it, who moved to a neighborhood expecting a certain lifestyle and want to freeze their own preferred configuration of shops, libraries, offices, and parks in time. While Glaeser's points about the downsides of centrally-directed growth are well-taken (that Baron Hausmann had the backing of the Emperor for his revitalization of Paris was surely key to its success in the face of the massive number of people his works displaced), I think it's difficult to look at the fierce opposition to growth as embodied by Regional Growth For Northcross, to use a random Walmart-hating example from my hometown of Austin, and conclude that neighborhoods actually don't have enough say in who sets up shop down the street. Strengthening the property rights of land owners is probably a safer bet for cities that want growth, and this means all land owners - individual homeowners and shopping mall builders alike. This book is part of a special program at Nashua Public Library where our mayor and a panel of experts will talk about this book and have a Q and A session . Scheduled November 17th,2016. Now this is a book with a lot of factoids and a series of ideas that gets one thinking. I was taken by the statement on page one> Factoid 1: All of humanity could fit in Texas,all with our own personal townhouse. However impractical, uncomfortable and destine to immediate catastrophe such an arrangement would This book is part of a special program at Nashua Public Library where our mayor and a panel of experts will talk about this book and have a Q and A session . Scheduled November 17th,2016. However impractical, uncomfortable and destine to immediate catastrophe such an arrangement would be is not the question at hand. It's if they could they fit each having a small yard. Without taking into account space for roads, schools, factories, parks, sewerage ,water, food and other resources and not all area are build-able, I would say this is true mathematically. This is the density of NYC. and given the desire to quantify quality of life I found this site> Which I think is a bogus way of looking at things but interesting. Factoid 2 : in the developing world, people are moving to urban areas at the rate of 5 million per month. Factoid 4: the Number of people working between 41st and 59th street in Manhattan is more than the number work force of New Hampshire. They have a higher annual payroll than Oregon. Counter intuitive idea- That NYC proximity premium grew as the cost of connectivity/working remotely fell. Jim's Factoid for my perspective: in 1974 US population was 213 million in 2014 it was 317 million about 50% higher. and my rural hometown of Plainfield Ct was roughly grew by less than 30% during that period. Factoid 6: in 1950, Detroit was America's fifth largest city with 1.85 million and in 2010 had 777 thousand. 8 of the top 10 largest cities have lost at least a fifth of their population since then. Edward Glaeser was preaching to the choir - I love cities! During my 40 years, I have lived in four cities - Detroit, Chicago, NYC, and London - all cities that Glaeser uses as frequent examples in this book. My problem with the book isn't the city love but the overall lack of structure and purpose. It is easy to understand why cities would have richer, smarter, greener, healthier, and happier citizens than rural areas - this could have been summed up in an essay. While Glaeser did an excellent Edward Glaeser was preaching to the choir - I love cities! During my 40 years, I have lived in four cities - Detroit, Chicago, NYC, and London - all cities that Glaeser uses as frequent examples in this book. My problem with the book isn't the city love but the overall lack of structure and purpose. It is easy to understand why cities would have richer, smarter, greener, healthier, and happier citizens than rural areas - this could have been summed up in an essay. While Glaeser did an excellent job explaining the factors that led to Detroit's decline, I was disappointed with his lack of solid ideas into what could help the city rebound. Historical facts are well-expounded but theories on present-day situations and predictions for the future are lacking and when put forward are not explained thoroughly. The few times Glaeser ventured a theory, it would be an easy-breezy idea full of holes/missing important details. For example: when discussing why people have stayed in Detroit despite the cold (Glaeser seems to despise winter!) and poverty, Glaeser states the reason is cheap, durable housing. "When cities decline, they decline very slowly, because people are loath to abandon something as valuable as a home." Have you been to Detroit!?! Have you seen the blocks of abandoned homes? It surely is more of a "I've got no where else to go" thing + that is where family/friends are. Another section states home ownership in Manhattan is low due to the "headache" of multifamily dwellings. How about how difficult it is to get a foot on the property ladder in Manhattan due to the high prices? Also, people could want the flexibility of renting, especially in jobs that transfer employees often. And the talk about letting developers have their way in the city, Glaeser never seems to pick a side - he repeatedly states that too many restrictions on development in the city is bad but does also write that a city should be well-planned. In defense of development he states "Chicago has allowed plenty of building along its long, beautiful lakefront, while New York has decided to "preserve" almost all of the best blocks facing Central Park". First, I don't think this a true statement - I have seen lots of development on 5th ave and CPW and second, how about a shout out to Marshall Field, the man who fought to save the lakefront of Chicago from development? Thanks to Mr. Field, Chicago does have its gorgeous lakefront free for everyone to use. I know Glaeser is referring to the west side of LSD but if it wasn't for Field all that development could have been on the east side of LSD, taking away one of Chicago's best features. Edward Glaeser is an economist with the Manhattan Institute--so my radar was up for conservative bias in this book, but if it's here, it's mild and mostly because he is an... economist! and looks at the world through that lens. But he also looks at -- and walks through and has lived in -- real cities so any quantitative perspective is balanced by the qualitative. He's an admirer of Jane Jacobs, my hero, but faults her for a bias towards historic preservation and relatively low urban densities th Edward Glaeser is an economist with the Manhattan Institute--so my radar was up for conservative bias in this book, but if it's here, it's mild and mostly because he is an... economist! and looks at the world through that lens. But he also looks at -- and walks through and has lived in -- real cities so any quantitative perspective is balanced by the qualitative. He's an admirer of Jane Jacobs, my hero, but faults her for a bias towards historic preservation and relatively low urban densities that hold back the best that cities can be. His main thesis is that cities "make us richer, smarter, greener, healthier and happier" because they mix up masses of people and that fosters collaboration and innovation that can't happen in rural or suburban isolation. Hence his bias towards greater density. He loves high rises, but on the Vancouver model--slender high rises set apart so every one in them has views and there's plenty of space in between. Can't argue with that. His critique of preservationists is persuasive. Paris is perfectly preserved and perfectly wonderful, but ordinary people can't live there because it's too expensive. He's also critical of the SF Bay Area for conservation that has driven up the cost of housing. But he's most critical of suburbia which pretends to be "green" but is actually more of an energy user and produce more carbon emissions per capita than denser cities which are more energy efficient. He thinks it's crazy that housing is cheap in Houston and places like it, so they grow even though energy costs are higher in climates like Houston or Phoenix or Atlanta--while energy costs are much lower in places like the Bay Area, but housing is expensive, largely, he argues, due to public policy and growth limits. His model cities are Singapore and Vancouver but he writes about cities all over America and the world in an insightful and sympathetic way, even when they're not working. And I even like cities! I really wish I had liked this book, which made my read of it all the more disappointing. As somebody who has lived in cities my entire adult life, I felt that this book was going to be a great opportunity to gain some new knowledge and put some facts behind my intuition that cities are a good thing for our bodies, minds, and environment. What I found instead was a lazy, jumbled mass of stories, facts, anecdotes, and opinions bent to attribute all good things that have ever occurred in humanity to the conglomeration of people into urban spaces. The tone right away in the first chapter turned me off to the book as a whole. It is opinion heavy, and the writing left you to assume that Glaser thinks that a) he's the first person who ever had the insight that there are inherent traits of cities that have greater value relative to suburban and rural areas, b) anybody that doesn't think that cities are the best solution when it comes to organizing people within a society is an idiot, and c) anybody who would choose to live outside of a city is an idiot. With that being said, we later find out that Glaser himself has moved to the suburbs because of the convenience of the drive to his workplace, the better schools offered by the suburbs, and the fact that he gets to have a yard. Once that admission makes it's first appearance, the rest of the book reads as his attempt to rationalize his decision and punt it to urban policymakers to improve cities in order to make people like him willing to live in them again. Especially caught in the crosshairs are the evil preservationists, who would choose to preserve the historical integrity of a city over turning over those lots to new skyscrapers so that we can keep housing prices low. There are some good points made about policymakers who confuse a city, which is a mass of connected humanity, with it's structures (e.g. failed attempts to build grand structures in Detroit to draw in urban professionals), but by the time I got to that point, I had lost interest. The other part of this book that really annoyed me was the forced association between human innovation and cities. At points, he even came up with his own clever terms for obvious observations. For example, "self-protecting urban innovation!" Translation: people (of course, especially in cities) figure out answers to their problems. Another one, on page 32, almost made me put the book down right then, but I decided to hate-read my way through the rest of this. On page 32, Glaser makes the argument that an invention as sophisticated as the printing press couldn't have just been invented by a solitary genius. One needed financial backers, who in Glaser's world can only reside in cities because large urban markets allow for these economies of scale to flourish and rural people wouldn't put up the volume of capital necessary for such an unsure bet. Ergo, credit cities for the invention of the printing press. Without the printing press, Martin Luther wouldn't have been able to spread the message of Protestantism. And voila, you can thank cities for the Protestant Reformation. If you follow that stream of logic, you know everything you need to about this book. In summary, if you have a friend that rags on cities and talks about the "Real America" and excludes cities from it, hide this book from them. It is exhibit A for the kind of arrogant, paternalistic, contemptuous thinking frequently found in the stereotypes draped onto city dwellers. Cities deserve better representation than this. I'm having some trouble with capturing my reaction to this book. Overall, the content and presentation were very interesting, but I don't necessarily agree with his conclusions. After reading the first chapter, I was very concerned about the rest of the book. It presented a whole bunch of opinions, stated as fact, with very little to back them up. I felt like arguing with all of them, even the ones I agreed with. Luckily I did better with the rest of the book, where the arguments are arranged logi I'm having some trouble with capturing my reaction to this book. Overall, the content and presentation were very interesting, but I don't necessarily agree with his conclusions. Luckily I did better with the rest of the book, where the arguments are arranged logically and supported with studies of particular cities. There were still some conclusions that I did not feel were supported by the facts given, and some where I could see the argument being made but still didn't agree. These were outweighed by the number of times the book had me thinking about issues and solutions I hadn't even considered before. In some respects this is the perfect cocktail party book that will supply you with Gladwell-ian trivia and hypotheses to ensure a longueur free evening. Yet Glaeser has given those of us who spend a lot of time thinking about cities some new material to chew on. Highly recommended. Sometime around 2010, the world's population passed a great milestone: for the first time in history, more people lived in cities than lived outside of them. We are fast leaving our agricultural past behind. Edward Glaeser argues that this transformation of the way we live is a very, very good thing. As compared with their rural cousins, people who live in cities have a much smaller carbon footprint. They are 50% more productive, if they live in a city over one million people. They live longer. T Sometime around 2010, the world's population passed a great milestone: for the first time in history, more people lived in cities than lived outside of them. We are fast leaving our agricultural past behind. Edward Glaeser argues that this transformation of the way we live is a very, very good thing. As compared with their rural cousins, people who live in cities have a much smaller carbon footprint. They are 50% more productive, if they live in a city over one million people. They live longer. They make more money. They are happier. They are less likely to commit suicide. This argument is a little twisted, if you believe in the notion that a life closer to nature is one that returns us to our roots, allows us to leave greener lives, and makes us healthier, calmer and generally morally superior to the degenerates in the city. Alas, people are voting with their feet. All that country greenery is nice, but what good is it if you can't find a job, you can't meet interesting people, and the nearest doctor is in the next county? So they leave and head for the big city. This process of urbanization is inexorable, says Glaeser. Other than during the Dark Ages, after the fall of Rome when the great cities of the empire returned to being villages as their starving inhabitants scattered to the countryside, the long term trend since the dawn of civilization has been towards more and more of us living in cities. But cities can be made even better, he says. It is when we resist the natural logic of the city -- for example, by using zoning laws to prevent high density development -- that we thwart the benefits we would otherwise gain. He cites Mumbai as an extreme example of this, where buildings are limited to 1 1/2 stories in height in the city center, which has created a vast, decentralized city with horrendous traffic jams. In Paris, where the heights of buildings have been limited to about five stories since Baron Haussmann tore down much of the city in the nineteenth century only to rebuild it more elegantly, real estate supply has been so restricted that only the rich can afford to live in the central city -- the poor are confined to the outer suburbs, filled with high-rises. Contrast this with cities such as Singapore and Hong Kong, where high density has created immensely vibrant cities with public transit systems that make it easy to get around and also drastically cut carbon emissions from cars. Glaeser generally believes that the job of city government is clear-cut: allow high density, mixed development. Keep the streets clean and above all, safe. Build basic systems infrastructure: transportation and sanitation and water and power. Provide a good educational system accessible to all. And don't impede business with excessive bureaucratic obstacles, especially the small businesses that keep the economy vibrant, adaptable and growing. Who loses out with this kind of model of governance? Lovers of old architecture will see their cities' brick and mortar heritage steadily swept away and replaced by newer, denser developments. Those who value small cities will be overcome by the forces of growth. Older businesses will have little protection from aggressive newcomers who out-compete them. Glaeser grew up in New York, and Manhattan is his model of what a great city should be. It is immensely productive -- a few blocks of mid-town Manhattan contributes as much to the nation's GDP as entire mid-sized states such as Oregon. It is safe. Public transportation is so good that New Yorkers use less fuel per capita than any other city in the country, by a wide margin. It is the intellectual heart of the nation. It is wildly multicultural. And it continues to evolve steadily, adapting to the times. As recently as the 1970's, the biggest industry in NYC was textiles. That industry crashed when the tsunami of globalization hit it, but NYC recovered within a decade or two and replaced manufacturing with financial services. Contrast this with what happened when Detroit was faced with a similar crisis due to the decline of its own mature manufacturing sector: the automobile industry. The city never adapted and never recovered. Today, it is bankrupt. Its population is a small fraction of what it was in 1950, and large sections of it are nearly deserted. Why the difference between NYC and Detroit? NYC relied on small businesses with a relatively high proportion of skilled workers, and invested in an excellent educational system. Detroit relied on three giant vertically integrated behemoths with a relatively low-skilled workforce, and tolerated a poor educational system. Predictably, NYC proved much nimbler at coping with environmental change than its dinosaur-like counterpart, Detroit. La ciudad triunfante descrita en un libro triunfal. Una de mis aficiones menos conocidas y de mis más grandes temas de interés es el del urbanismo. ¿Cómo viven las ciudades? ¿Cómo evolucionan? ¿Cómo crecen? ¿Cómo mejorarlas para hacerlas más decentes hacia la gente? y sobretodo, ¿Cómo hacerlas fancy para vivir? Este interés nació cuando tenía como catorce años, pero la inquietud siempre me ha acompañado. Supongo que porque nací en una ciudad destruida, mal gobernada, mal representada y con un pro La ciudad triunfante descrita en un libro triunfal. Supongo que porque nací en una ciudad destruida, mal gobernada, mal representada y con un problema de contaminación ambiental que se antojaba irresoluble. El olor del smog y la sensación de esa bruma sucia son de los recuerdos más potentes de mi infancia. En años recientes mi ciudad (que es chinampa en un lago escondido) está, de acuerdo a Lonely Planet, empezando a 'limpiar su acto' y limpiar su nombre. Con errores y omisiones, por supuesto. De base, que la ciudad es la expresión natural de la colaboración humana, donde más personas interactúan personalmente para diseminar el conocimiento e intercambiar bienes y servicios. La gente es más próspera en las ciudades. 1. No está mal la existencia de chabolas o ciudades perdidas, porque eso implica que las ciudades están vivas y atraen a gente que de otro modo tendría una vida mucho más infame. Lo que está mal es que no tengan agua limpia, que sufran de crimen y suciedad. Y aquí se requiere la vigorosa intervención del gobierno local. 2. Está mal restringir la altura de los rascacielos. So far so good. Los requerimientos de máximos pisos (y en el caso de mi ciudad añadamos la absurda regla de los cajones mínimos de estacionamiento). Esto favorece la extensión horizontal y no es nada sostenible. 3. Está mal restringir la construcción, porque eso sólo encarece las ciudades. 4. Está mal construir más vialidades, porque eso sólo hace que aumente el tráfico. Económicamente lo correcto es comenzar a cobrar al automovilista las externalidades que genera con un cargo por tráfico. 3. Hay que aprender un balance cuidadoso en decidir qué arquitectura preservar y cuál tirar para densificar las ciudades. El preservar por preservar sólo encarece las ciudades. 4. Lo mejor en lo que puede invertir una ciudad, además de los básicos (agua, seguridad, limpieza) es educación. La buena educación sirve como un imán para el talento. 5. Los suburbios no son el diablo, pero su crecimiento se ha agravado debido políticas que favorecen la adquisición de vivienda, la adquisición de automóvil y el manejo al trabajo. Las políticas deberían reencaminarse a redensificar las ciudades. 6. Buena parte del futuro de las emisiones de carbono del mundo dependen de qué modelo de urbanización escojan China e India, con su rápido crecimiento y rápida industrialización. 7. El tratar de hacer 'verde' a un lugar, es decir, más ecológicamente sustentable, a base de limitar la densificación sólo hace que la gente viva de manera menos sustentable en otro lado. 9. El intentar revivir ciudades en declive a base de grandes obras de infraestructura sólo es 'echarle dinero bueno al malo'. Lo mejor es invertir en la gente y que ellos escojan dónde quieren vivir. En general, el libro me ayudó a reforzar algunas ideas básicas de urbanismo que ya conocía, a cuestionarme mi normal creencia en la superioridad del suburbio (he sido suburbanita toda mi vida) y a reforzar la idea de que necesitamos desesperadamente tener un transporte público más decente. Hopefully my rating will not undermine the value of the ideas inside this book too much, since many of the arguments presented were well argued and important. However I find the book repetitive, tiring and boring. I believe the book could've been shrunk by half and it would've been better and more brilliant. I have lived in several cities; I lived in Houston for thirty years. In this book, Mr Glaeser's remarks about Houston are, in my opinion, so unconnected from the quotidian realities of the place, I wonder whether they constitute a misprint — perhaps he meant his remarks to refer to another place. If Houston really is the city to which his remarks refer, they sound — there is no other word for it — bizarre. I guess the kindest construction that could be put onto them, is that they have been adduc I have lived in several cities; I lived in Houston for thirty years. In this book, Mr Glaeser's remarks about Houston are, in my opinion, so unconnected from the quotidian realities of the place, I wonder whether they constitute a misprint — perhaps he meant his remarks to refer to another place. If Houston really is the city to which his remarks refer, they sound — there is no other word for it — bizarre. I guess the kindest construction that could be put onto them, is that they have been adduced to support the arguments that the book makes. Which is to say, that in this one example at least, the reality has been adjusted to fit, rather than the usual procedure — at least for those who live and work outside the city limits of Cambridge, Massachusetts — which is to make observations and then, to draw conclusions from those observations. Perhaps his remarks constitute but one defect in an otherwise carefully researched book; I hope that is the case. Cities desperately need a champion, someone who will make a case for the need for cities, not merely as marketplaces or conveniences, but as the principal places for civilization (C. Northcote Parkinson remarked that “civilization” means “the art of living in cities”). However — since most of the author’s pronouncements have been delivered in the same breezy, glib fashion — I suspect that the many other examples offered may be similarly insubstantial. The whole book reads like the sort of thing designed to generate lectures at conferences — those brief gatherings where a pundit flies in for a day, delivers a few aperçus designed to flatter the prejudices of his audience, and then, takes the next plane out in the morning … never having spent any real time getting to know the place. This proved to be an interesting book based on a somewhat controversial premise: “cities magnify humanity’s strengths.” In general, the more that people live in highly dense living conditions, conditions that are provided so as to make urban living both satisfying and conducive to innovation and social improvement, the better off our citizens will be and the better off our environment will be. A lot of challenging positions are asserted by Glaeser and he provides a lot of examples showing how var This proved to be an interesting book based on a somewhat controversial premise: “cities magnify humanity’s strengths.” In general, the more that people live in highly dense living conditions, conditions that are provided so as to make urban living both satisfying and conducive to innovation and social improvement, the better off our citizens will be and the better off our environment will be. A lot of challenging positions are asserted by Glaeser and he provides a lot of examples showing how various cities, worldwide, have failed or succeeded. He attacks a lot of common public policy positions that he believes are wrong-headed and that lead to exactly the consequences we don’t want. For example, environmentalists fight for and praise restrictions that support preservation, reduce density and preserve public lands. The result is fewer housing opportunities and higher living costs. The result: places like Houston that promotes unrestricted growth and sprawl have low living costs but in an area that requires huge energy costs for cooling and transportation. People move to Houston in droves whereas no one can afford to move to the San Francisco Bay Area. Houston has a much higher carbon footprint than the Bay Area where a temperate climate and higher density reduce global warming. He attacks many other policies that he believes lead to bad environmental outcomes: federal highway programs, the mortgage tax deduction, low gas prices (he favors a simple carbon tax!). Environmentalists don’t come off looking much better than some urban leaders in his view. So we need, according to Glaeser, most dense, livable cities, building up, up and up, all with affordable housing that will attract us to live that way. It’s a book that really challenges us to think and see things in a different light. Some of it irritated me, in part because it challenged my preconceived ideas. I assume this was good for me. I'd like to see a good rebuttal of him, but I couldn't think of any myself. The worst thing I could say about this book is that I think his writing style was a little too simple. This is a stirring defense of cities, and the benefits they can offer. As someone who grew up in Detroit, I've spent the last ten years defending it. Glaeser spends a whole chapter (and constant asides elsewhere) explaining what happened to Detroit, and why it will be so hard to bring it back. (The short version: large c I'd like to see a good rebuttal of him, but I couldn't think of any myself. The worst thing I could say about this book is that I think his writing style was a little too simple. This is a stirring defense of cities, and the benefits they can offer. As someone who grew up in Detroit, I've spent the last ten years defending it. Glaeser spends a whole chapter (and constant asides elsewhere) explaining what happened to Detroit, and why it will be so hard to bring it back. (The short version: large companies who don't need smart workers stifle both competition and education, both of which are bad for the city). There are a number of other snippets that make the book worth reading- like his argument that local environmentalism, especially on the coasts, is bad for the environment. The fewer people are allowed to live in California because of zoning laws, the more will move to Houston and Phoenix, where they will drive more and use the air conditioner more. Edit: I should say that this book has come closer than anything else I've ever read to making me really optimistic for the future. I'm still a subscriber to Malthus, in the end, and while I think he did a fantastic job of arguing that large cities are the best way to make the world richer and happier, and making those cities dense is the best way to have a massive population without too much pollution. But he didn't engage with the idea of the depletion of resources that that would entail. Of course, that wasn't what the book was about, so I can't really fault him for not going into it, but that's why I'm still not certain that we've really broken out of the Malthusian cycle, rather than just pausing it for a couple centuries. The themes of the book are interesting, cities are the greenest living spaces and are intellectually productive. Stewart Brand and others have written good stuff on the first and many have written on the later. He does try and answer the questions why cities thrive or die, what makes one city better than another? Other interesting bits are short sketches of different cities and their evolution. I didn't realize how extensive the remodeling of Paris was, good stuff! Also good is the evolution of The themes of the book are interesting, cities are the greenest living spaces and are intellectually productive. Stewart Brand and others have written good stuff on the first and many have written on the later. He does try and answer the questions why cities thrive or die, what makes one city better than another? Other interesting bits are short sketches of different cities and their evolution. I didn't realize how extensive the remodeling of Paris was, good stuff! Also good is the evolution of 'burbs and the anti-city bias of early American authors like Thoreau and Jefferson. I do have some bones to pick, this author comes across as a free-market economist, which given who he works for is not surprising. He touts lack of zoning in Texas as a great thing, I guess he doesn't have any children going to school next to a chemical plant. He also poo-poos NIMBYism and environmental impact reports, why should anyone but the owner decide what to do with their land? This is ironic since several of the cities that he admires were controlled by dictators or emperors that ran roughshod over property owners. He also repeats that hoary old chestnut about education not improving with more money, can teaching really occur in classrooms of 40+ students without an adequate supply of books and other materials? A real situation in parts of California. Vouchers of course are the real answer. This book is thought provoking and would probably make a good book club read. This is a review of current thinking on the city by a Harvard economist who specializes in such work. Glaeser is a big fan of Jame Jacobs, so the book serves as an interesting update to Jacob's book, The Death and Life of Great American Cities. He adds, however, that Jacobs was not an economist and so misunderstood some points, such as the unintended consequences of restricting the size and extent of building in a city - that preservation and limits building will lead to the marginalization of c This is a review of current thinking on the city by a Harvard economist who specializes in such work. Glaeser is a big fan of Jame Jacobs, so the book serves as an interesting update to Jacob's book, The Death and Life of Great American Cities. He adds, however, that Jacobs was not an economist and so misunderstood some points, such as the unintended consequences of restricting the size and extent of building in a city - that preservation and limits building will lead to the marginalization of cities with gentrification along the way, which to me is a reasonable comment on Jacobs' great book. The major takeaway from this book is counterintuitive, namely that in some very important ways, building up cities is much more friendly to the economy and to limiting global warming than is limiting cities and building green suburbs. It is counterintuitive but it leads to some really interesting arguments about city planning, both in the US and in Asia. Glaeser also provides lots of updated info on lots of cities, from Chicago, Atlanta, and Detroit to Singapore and the nascent high growth Chinese cities. I have to give this a very low three stars. While containing a good deal of informative content and good ideas, the tone of the book is more abrasive to me than almost any other book I've read. I've never had to describe a book's tone as such before, so I had to check out a thesaurus to find just how to explain it. Glaeser is sickeningly smarmy, unduly unctuous, and atrociously adulatory. Though he repeats on numerous occasions that the failings of the city are tragedies in need of fixing, such I have to give this a very low three stars. While containing a good deal of informative content and good ideas, the tone of the book is more abrasive to me than almost any other book I've read. I've never had to describe a book's tone as such before, so I had to check out a thesaurus to find just how to explain it. Glaeser is sickeningly smarmy, unduly unctuous, and atrociously adulatory. Though he repeats on numerous occasions that the failings of the city are tragedies in need of fixing, such assertions are one-offs followed or preceded by pages and pages of fetishistic glee over the city's economic potential and strawmen of opponents proposing that impoverished city dwellers return to urban life. About half-way through I could stand it no more, put the book down, and went on to more tolerable fare. I don't really know why reading this was such a complete and utter chore - in small doses it was quite interesting, but attempting to read it for any longer than a couple of pages resulted in my mind wandering off and subsequently having to re read the last paragraph again. As such this took me an embarrassingly long amount of time to finish. As you would expect from the title, the book is basically a eulogy to cities and an attempt to frame why the drive towards suburban living in America and el I don't really know why reading this was such a complete and utter chore - in small doses it was quite interesting, but attempting to read it for any longer than a couple of pages resulted in my mind wandering off and subsequently having to re read the last paragraph again. As such this took me an embarrassingly long amount of time to finish. As you would expect from the title, the book is basically a eulogy to cities and an attempt to frame why the drive towards suburban living in America and elsewhere is fundamentally flawed. There are some very fascinating anecdotes presented along the way (e.g. brief history of Singapore) but there is also a high degree of repetition and some of the arguments feel really jumbled. I think he's wrong on a lot of stuff according to other academics I've read and perhaps he overstates some of his opinions (and they are opinions because he doesn't cite to much data), but the book is well-written and I think he is absolutely right in broad strokes. Cities have a lower carbon footprint and they can be hubs of innovation. For a better and more recent book about some of these themes (that is backed by data), read The New Geography of Jobs. A few interesting ideas, but I am sure he could have said the same in 1/10th of the pages. One of those books that I read to mostly in order to recommend it to others. I'm already part of the urbanist converted, and Glaeser is preaching to the choir. For those of you who are comfortably content in the suburbs, or wary of the chaotic hustle and bustle of dense, tall cities, this is the book for you. It is part urban history, part policy argument. Or, perhaps better put, it's a convincing policy argument grounded on the past few centuries of urban and economic history. The argument is t One of those books that I read to mostly in order to recommend it to others. I'm already part of the urbanist converted, and Glaeser is preaching to the choir. For those of you who are comfortably content in the suburbs, or wary of the chaotic hustle and bustle of dense, tall cities, this is the book for you. It is part urban history, part policy argument. Or, perhaps better put, it's a convincing policy argument grounded on the past few centuries of urban and economic history. The argument is this: It's crucial to our social, economic, and environmental well being that we reverse legislation and tax incentives that encourage urban residents to move from city centers to the suburbs. Policies like the disastrous mortgage interest tax deduction, which encourages urban residents who rent apartments in productive city centers to move to cheap suburban communities to buy cookie-cutter McMansions that dramatically increase the economic and environmental cost of delivering public services and transportation. Or the ridiculously low gasoline tax, which encourages more people to drive in cars rather than take public transportation. (It's even worse here in Mexico, where gasoline is subsidized by the government; money that could be spent on relieving poverty.) "In the mid-1990s," Glaeser reminds us, "when the average price for a gallon of gas in the U.S. was close to $1, the average price per gallon in Italy or France was close to $5." And worst of all, zoning policies (like those in the Silicon Valley, Mumbai, Washington DC, and Mexico City) keep most buildings no taller than three or four stories, limiting the supply of downtown housing and raising the cost of living so high that the middle and working class are forced to live in the suburbs and exurbs. In other words, the cards are stacked against cities; most governments incentivize suburbanization. Why is that a problem? First, because cities are far more productive. "Today, the five zip codes that occupy the mile of Manhattan between Forty-first and Fifty-ninth streets employ six hundred thousand workers (more than New Hampshire or Maine), who earn on average more than $100,000 each, giving that tiny piece of real estate a larger annual payroll than Oregon or Nevada." According to Glaeser's math, "Americans who live in metropolitan areas with more than a million residents are, on average, more than 50 percent more productive than Americans who live in smaller metropolitan areas." Yet some of the country's most productive cities, like San Francisco and Boston, push residents out to less productive suburbs (or worse, to Houston and Phoenix) because zoning policies prevent tall buildings which raise home prices, ultimately pushing out the middle and working class. Urban residents are, on average, also healthier than suburban residents (they spend more time walking and much less time stuck in traffic). They also report to be happier (probably because they have much more access to cultural activities and are closer to their friends). Glaeser's argument is so convincing that it's frustrating. One of the most interesting sections of the book is its thorough, complex histories of three technologies that would come to define the 20th century: the skyscraper, the car, and the affordable suburban house. At the turn of the 20th century, thanks to the invention of the Otis safety elevator, it seemed that the skyscraper would usher in a century of dense, urban living. "But twentieth-century urban America didn’t belong to the skyscraper; it belonged to the car." Eisenhower subsidized the Interstate Highway System. Then William Levitt's perfection of mass-produced suburbia combined with the GI Bill led to a perfect recipe that ensured that the 20th century would belong to cars, suburban cookie-cutter homes, smog, traffic, and parking lots everywhere you look. It's frustrating to read this history and think what if … what if, the skyscraper had won and the car and suburb had lost? What would the world look like today? Even more frustrating is the likelihood that either America's mortgage interest tax deduction or Mexico's gas subsidy will be repealed. In the short term, there is no likelihood. Certainly mistaken policies are responsible for harmful suburbanization at the expense of productivity and environmental conservation, but even if those policies are reversed, will we see more urbanization and less suburbanization? I have a feeling that was the exact question that Andres Lajous was asking himself this weekend when he penned an imaginary dialogue with a civil servant. The text, which is in Spanish, pokes fun at the new young urbanist movement, of which Andrés was one of the early militants. "What's going to happen when you have kids?" the civil servant asks him. "Are you going to take them to the emergency room on the metro? Are you going to take them to their private schools on the back of your bicycle? No, you're going to move to the suburbs and you're going to wait in traffic, and you're going to complain just like all the others." Already several of my friends here in Mexico City are contemplating heading for the suburbs. All the typical reasons … soft grass for their kids to play on, better schools, less noise. Some are even looking for a greater sense of community. As Angela Giglia has argued in her fascinating ethnography of gated communities in Mexico City, while such communities frequently isolate residents from wider democratic involvement, new forms of community decision-making come about within the gated perimeter. How can cities retain their young talent? They need to offer more. More green parks, more playgrounds for kids. Public transportation that is as inviting as a luxury automobile (like many European cities). Frequent cultural events. Well financed public schools with clear incentives and paths toward upward mobility. The Project for Public Spaces has a handy list and a great blog that profiles successful developments and interventions. It's not rocket science. But it is incredible how wrong we got it in the US throughout the 20th century. If China and India follow our car-centered, suburban path, there's no way the planet will hold up. ★★★ Good content, but not the most captivating read. A book for those already interested in cities, urbanism, and housing who want a complete survey of the space in one package. Edward Glaeser is an economist at Harvard and an important figure in pro-housing circles. I’ve read several of his papers, like Why Have Housing Prices Gone Up? (2005) and The Economic Implications of Housing Supply (2018). I’m a big fan. Triumph of the City covers the entire range of pro-urban, pro-housing arguments, fles ★★★ Good content, but not the most captivating read. A book for those already interested in cities, urbanism, and housing who want a complete survey of the space in one package. Triumph of the City covers the entire range of pro-urban, pro-housing arguments, fleshing out the usual points with historical perspectives, global comparisons, and lots of data points. In short, it’s what you’d expect from an economist. The writing is also what you’d expect from an economist: fairly dry, with a bit of a muddled structure. It might have been more successful as a set of independent papers, although even within individual chapters I felt like I lost the thread at times. It’s clear Glaeser lovers cities, but it comes across mostly at a theoretical level, not the inspiring, human-scale love someone like Jane Jacobs manages to capture. * A middle class family in Houston making $10,000 less than a New York City family has is 58% higher real income, due to cost of living including housing. * Homes typically cost no more than 25% over cost of construction. Los Angeles cost of construction is 25% higher than in Houston, but homes cost 350% more. Prices of new Manhattan condos are more than 100% above the cost of construction. Edward Glaeser outlined the principles of a successful city and how a city failed to function properly. The fact that great american and european cities were formed not in a day- it took vast amount of time, smart leaders and radical strategy. I agree with his point about false reasoning when rebuilding structures is equally to recovering a city. Concrete jungle, at a certain point is useless without human resources. By doing this it only favours to contractors pocket and not existing residents. Edward Glaeser outlined the principles of a successful city and how a city failed to function properly. The fact that great american and european cities were formed not in a day- it took vast amount of time, smart leaders and radical strategy. I agree with his point about false reasoning when rebuilding structures is equally to recovering a city. Concrete jungle, at a certain point is useless without human resources. By doing this it only favours to contractors pocket and not existing residents. Investing in human capital (school, university, forums) should be one of the solution considering for a place to survive throughout the time. As industrialization decline, Manchester for example lost its main activity hence human capital comes in order for the city to stay relevant. However, the solution to traffic jam which is congestion pricing that have been introduced in London and Singapore is recessive. It hurts the poor much more than people with enough money. Building new road itself is a paradox solution- it's like we're promoting car commutes instead of public transport. For some reason the only reasonable way to solve this by making drivers pay for the consequences they'll make, but i hope there will be more efficient way of solving this. This is a must-read for everyone. Though it was written a decade ago, it is still wholly relevant in today’s world. It is so important to realize and understand that our cities hold the answer to some of the world’s biggest issues, from climate change and traffic congestion to education and even entertainment. I have studied the sociology, politics, and geography of cities for a few years, but this economic perspective was new for me. I think Glaeser’s recommendations are good overall, but I found his writing a bit meandering at times. Also, many sections would have benefited from graphs or charts visualizing statistics! "America became a great nation because of the stream of human talents that flowed to its shores before 1921 and that shutting down that flow after World War 1 was one of the greatest mistakes that the nation has ever made." “A wealth of research confirms the importance of face-to-face contact. One experiment performed by two researchers at the University of Michigan challenged groups of six students to play a game in which everyone could earn money by cooperating. One set of groups met for ten minutes face-to-face to discuss strategy before playing. Another set of groups had thirty minutes for electronic interaction. The groups that met in person cooperated well and earned more money. The groups that had only connected electronically fell apart, as members put their personal gains ahead of the group’s needs. This finding resonates well with many other experiments, which have shown that face-to-face contact leads to more trust, generosity, and cooperation than any other sort of interaction. The very first experiment in social psychology was conducted by a University of Indiana psychologist who was also an avid bicyclist. He noted that “racing men” believe that “the value of a pace,” or competitor, shaves twenty to thirty seconds off the time of a mile. To rigorously test the value of human proximity, he got forty children to compete at spinning fishing reels to pull a cable. In all cases, the kids were supposed to go as fast as they could, but most of them, especially the slower ones, were much quicker when they were paired with another child. Modern statistical evidence finds that young professionals today work longer hours if they live in a metropolitan area with plenty of competitors in their own occupational niche. Supermarket checkouts provide a particularly striking example of the power of proximity. As anyone who has been to a grocery store knows, checkout clerks differ wildly in their speed and competence. In one major chain, clerks with differing abilities are more or less randomly shuffled across shifts, which enabled two economists to look at the impact of productive peers. It turns out that the productivity of average clerks rises substantially when there is a star clerk working on their shift, and those same average clerks get worse when their shift is filled with below-average clerks.